Yesterday, I was down at the wet market. I remembered there is this stall selling fresh grated coconut and I just decided to buy some home with no idea how to use it. You see, getting from the wet market near my place is tough. You need to be really early or else they were sold out by late morning. As I was waiting for my turn to place order, I saw tapioca. Apparently they sell that too (in grated form). Out of impulse, I bought that too. Now with coconut and tapioca on hand, I went in search of a recipe and tada…. 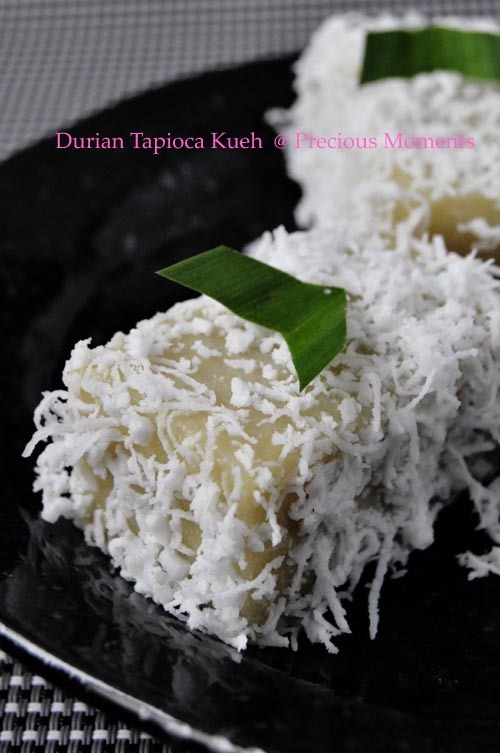 Durian Tapioca Kueh is what I churned out. Definitely make hubby happy as coconut is one of his deprived favourite. Today I make another new friend, this time, a young man that is 25 years younger than I am. It started with me joining a gardening club as I was clueless on how to set up a herb garden. This young chap offered to help me to with this little project. I was so touched by his gesture as we were total strangers. We were meant to get started on this project on 18 March but he said he want to see how the area looks like so that he can draw up a plan. So today we met up. The look and see turned into some serious digging. Adding burnt soil and compost. By the time the planter box is done, we were already in total work out. You are an angel sent down to help me. Thanks KW for helping me. Without your help, I believe I will be still digging for the next couple of days! On our next meeting, I have to remember to bring some nice goodies for this young man to share with his mom. Love this nice feeling to end the week. Boil sugar and pandan leaves for 5 mins to infuse the pandan flavour. Set aside to cool a little. Combine grated tapioca and tapioca flour together and mix well. Add coconut milk and sugar mixture, durian puree to the tapioca and mixed well. Pour the mix into a 8” tin and steam for 30-45mins. Leave the Tapioca kueh to cool. Cut into pieces and coat with shredded coconut and serve. My husband will drool if he sees the kueh. He's also deprived of such kueh with coconut! Oh.. no wonder u were asking me about my garden. I hope my MIL will discard the rue, the smell is making me nauseous. It's her plant not mine. Busygran, you don't take coconut too? I can imagine the deprived hubby. Mine kept topping up with grated coconut. LOLz. Wendy, yes. that was the reason. I love coconut too, bread, kueh, everything. I am sure yours taste great. But is durian in the season already ? You are so sweet showing your gratitude to your new friend. These kueh looks very good and I believe he will be touched receiving these kueh from you. I love coconut and durian. So tell me whether I will like this or not? hehe.. Don't put this in front of me, I will wollop them all by myself. No Sharing!